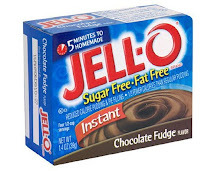 Sugar-free, Fat -free Jell-o pudding. This is one tasty new favorite of mine. I've found that having a batch of this whipped up in the fridge helps me get that quick sweet fix when I need it without taking part in ice cream or a baked treat. All you have to do is add milk and refrigerate. I'm really proud of myself for buying this, as I had the idea while cruising the baking aisle for a brownie mix to recreationally prepare and enjoy...all by myself. I bought this instead! Paula Deen, we can still be friends! I came onto this recipe on foodnetwork.com, which is an excellent go-to fo r the novice chef. You can find just about anything you need, and so much more there. With my renewed effort to slenderize, I assumed me and my old homegirl Paula Deen - queen of cream, butter and my heart - had to breakup. No! This is White Bean Chili. 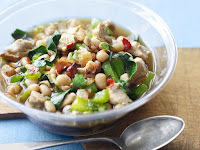 It's made with chicken, spices, veggies and navy beans. There isn't a thing bad for you in the recipe! I made it for manfriend and we both slurped this tasty little find until we were stuffed (mastering portion control is still on the to-do list). Collard greens are a major aspect of it, and this was my first time to try them. Not exactly sold on them, but I feel like it was something a Southern girl should take part in at least once. Highly recommend. I've always been adverse to canned meats of all sorts. However, I've also been trying to devise ways to prepare and pack a salad for lunch. Meat in a salad is a must for me. I also face the logistical problem of never having my shiz together in the morning enough to do the requisite chopping, chicken breast heating and dressing measuring for a fresh lunchtime salad. 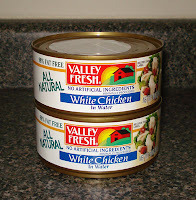 (Let's assume waking up earlier to give myself more time is not an option) Alas, I decided to give this canned chicken a whirl to save time. It's just lean white meat...extremely healthy choice. It was an overwhelming success. Today was the pilot run and I loved my fresh, delicious and healthy lunch. Will be doing this regularly. Brainstorming more applications. This is my favorit e new recipe of this 2010 skinniness endeavor. 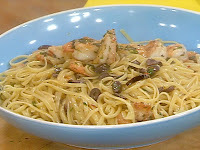 It's Greek Style Shrimp Scampi. It isn't the absolute most healthy thing I've tried, but the most manfriend-friendly. The shrimp is grilled and the sauce has no butter or cream, which are the pluses. The downside is that the meal has a carb element (linguine) and cheese (but I did do fat-free feta). Those bad things aside, it is super tasty and has lots of flavor, which is one of my biggest knocks on healthy foods. Try this one, but be warned it can turn out a little spicy. Maybe I'll give Rachel Ray another chance, other than this dish I find her detestable. All in all, I'm exhilarated by my adventures and misadventures in the kitchen. I'm going to try to photograph these efforts next time, and knock out the dieting and blog upgrade resolutions in one swoop. Hello 2010, I'm ready to take you on. I agree that Greek Style Scampi is "Manfriend-Friendly". It doesn't taste like diet food. However, it is not "Casey-Friendly" if you add a manly amount of red pepper flakes. Sorry about that.